I realized that no matter who we meet in this world or when and how we meet them, we label them very quickly. We immediately base our opinion of a person on a first impression, maybe a few things they have shared about themselves or even on things we have heard about them and give them a label in our mind based on what we have experienced throughout our lives. To me this is really unfair. It takes a long time to truly get to know someone and labels are something that society has created for us when no one person fits the mold of just one label. Every single person in this world is so individual and different that there is not one person exactly like them. You can’t compare two people, for example, because they were both born in the same state, or country for that matter. Those characteristics mean nothing except for on a birth certificate. 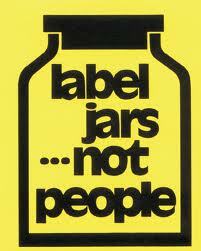 I think that our country in particular has a huge problem with labels. Whether it be by race, gender, sexual orientation or religion, we are quick to judge and quick to categorize the people we meet, sometimes out of fear, many times out of ignorance. I know that I have been a victim of that as I have been on the other end just as much. The moment you label someone and preconceive that you know everything about them, you wil never truly be able to relate to them. You have created your own blinders and will never truly be able to understand the truth they tell or show you about themselves. It’s sad and I really hope that I can void myself of this. It isn’t easy. We are a world of symbols used to label things, so we naturally do that with people. I just hope that people can work on being more open minded, accepting and willing to learn about others before making assumptions. We could lose out on learning so much about others, ourselves and this world and may even lose out on getting to know some really awesome new people.